Wow. That’s about all I can say. 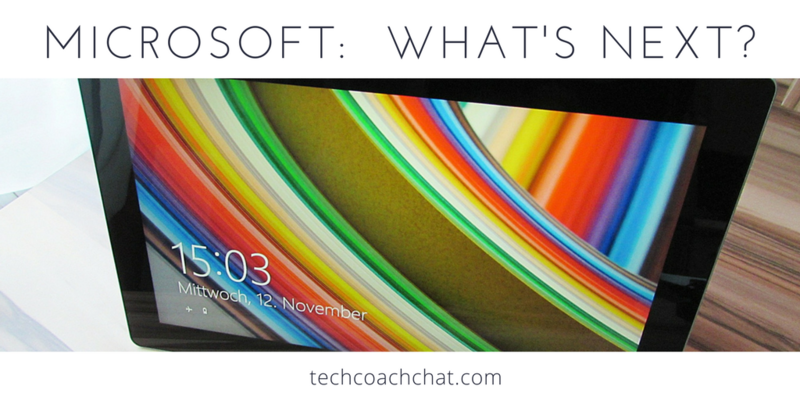 I’m still reeling from the Microsoft “Learn What’s Next” event. It was like every announcement just built up more and more about how the Microsoft ecosystem is going to change. They thought about kids and teachers at every level and wanted to make sure they are prepared for jobs that do not exist yet. That’s the heart of what we should be doing in education. It underscores Microsoft’s commitment to education and challenges other education systems to step up as well. Among the announcements, four really stood out to me as things that would effect my practice: Microsoft Teams, Code Builder for Minecraft: Education Edition, Mixed Reality, and STEM Days. Don’t get me wrong, I think Windows 10S is going to be amazing and I want a Surface laptop (with pro on it)…but they won’t effect my practice the way I think these other things will. I am most excited about Microsoft Teams. The idea of being able to work on documents from within a central hub is HUGE. It will help our students with organizational challenges immensely. I haven’t had a chance to check it out yet – this has been a busy week – but I’ve done a bit of research to get ready. Of course the challenge will be to get proficient with it before it rolls out and we have to train teachers to be prepared for the fall. Code builder for Minecraft: Education Edition really looks promising. While I love the idea of Minecraft – and I’ve actually dabbled in it – I still haven’t figured out how to add it to my practice. I’m drawn to it because of the immersive nature of virtual worlds that I find addicting (I used to rent an apartment in Second Life). It’s forward thinking of Microsoft to realize that students need to be able to take all of this creating that they are doing to another level. Using code to build in Minecraft is just the next logical step – especially since kids are learning to code in so many other areas. It’s another example of those great intersections between “school” and “play” that I love. I hope to be able to take a workshop or two on Minecraft at ISTE17 next month. I know the best way is just to dive in, but that takes a time commitment that I just don’t have yet. I’ll have to be content to chip away at it building my skills over time right now. I don’t have a kid, but I gonna borrow one so that I can go to one of these STEM Saturdays. While the Hacking STEM lesson plans are free it’s always great to see a demonstration. Almost like being coached myself. Of course being able to see it done with random kids will definitely help me think about how to walk a teacher through using the lessons. I might just go by myself to observe one week! I’m intrigued by the possibilities of what mixed reality could mean for a classroom. A bit concerned that Microsoft has chosen to partner with Pearson though. I want to play with this “view mixed reality” when it comes out. I’d like to see what it is capable of doing and how that might impact urban students particularly. Did you see the broadcast? What did you find exciting?